A way of life that hasn’t changed in centuries. Activities, traditions and practices that have been passed down from father to son, mother to daughter for thousands of years. It’s a reminder of the way life was and continues to be, moving in a parallel plane to the fast-paced, modern, busy world that we belong to. It’s a chance to stop and take stock and I hope there will never become a time when I become blasé and not see the beauty in these traditions and customs. 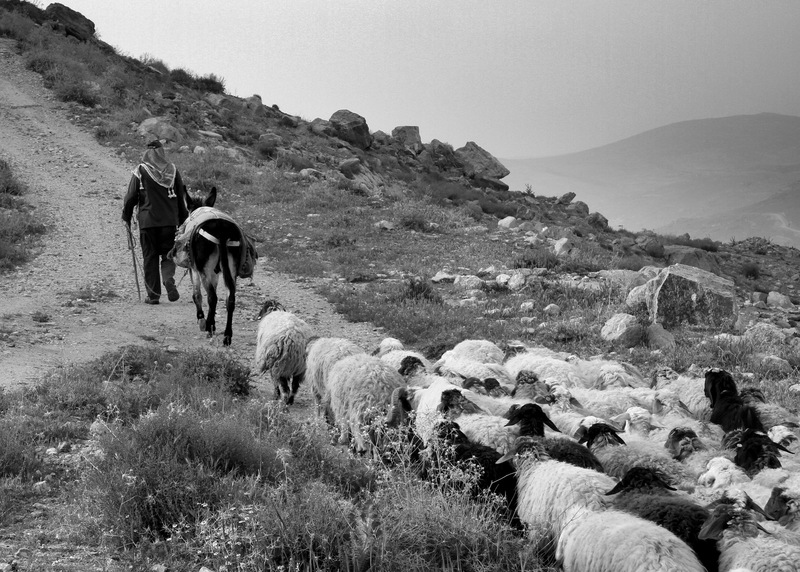 One such tradition is Shepherds tending to their flocks like their ancestors have done so before them. The light of a new day sees the Shepherd releasing his flock from their nightly enclosure. The flock charge forth eager for a day of grazing on the mountains around. 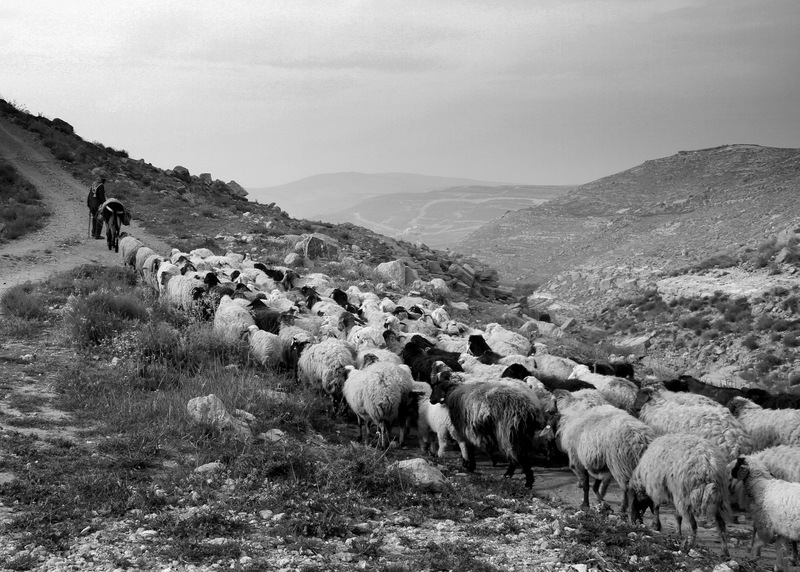 With a measured pace the flock falls into line, each with their place, their purpose known. For those watching it looks like a perfectly orchestrated maneuver and indeed it has been practiced and learned. To help with keeping the flock together and moving in an orderly manner they have been imprinted to follow the sound of a bell. 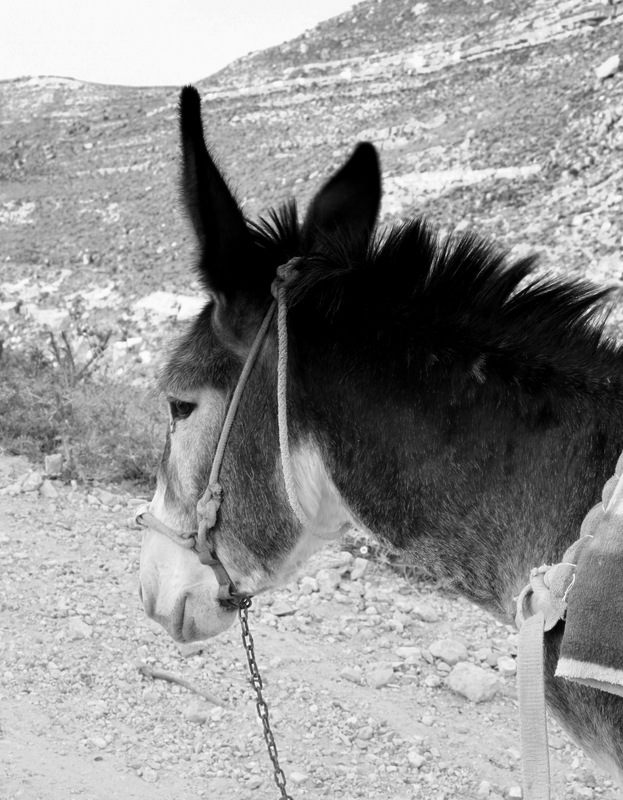 Quite often this is done with the aid of a donkey. 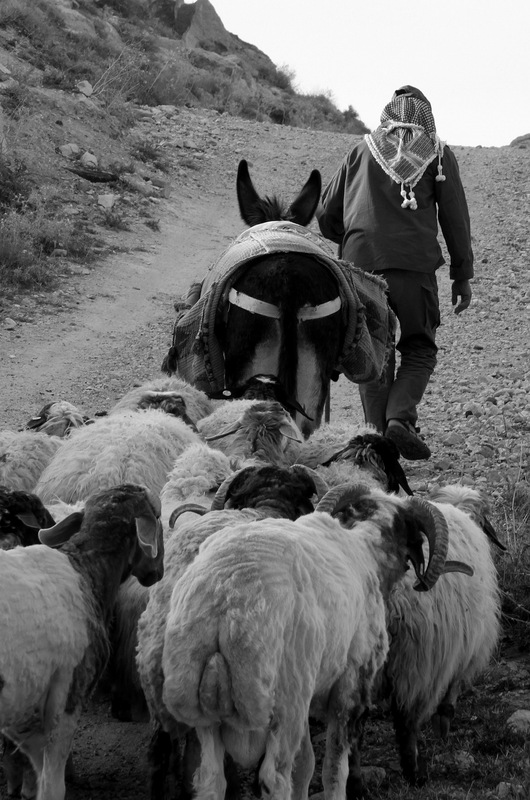 Young sheep, abandoned by their mothers, are imprinted onto the donkey using a suckling bag. 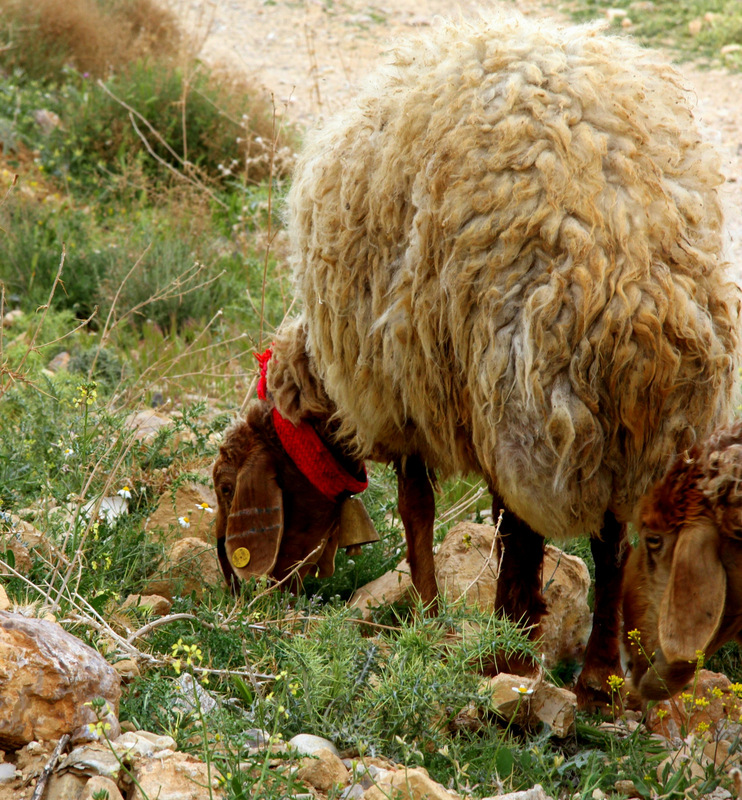 The donkey wears a bell and bells are also attached to the young sheep. Wherever the donkey goes the young sheep will follow their pseudo mother, the bell calling out to them as a mother bleats for her young. The rest of the sheep follow the melodic ringing from the bells of the other sheep, and so the saying goes “acting like sheep”. As the afternoon draws to a close the Shepherd turns the donkey homewards and the procession begins again. The sun sweeping across the sky like a conductor drawing the orchestra to a final crescendo, bringing harmony to the bells clanging out their brassy tune, the bleating of the sheep and the gentle guttural “Hey Hey” call of the Shepherd. A beautiful time of day to find a rock to sit on and watch, listen and forget the busyness of the world for a few minutes. 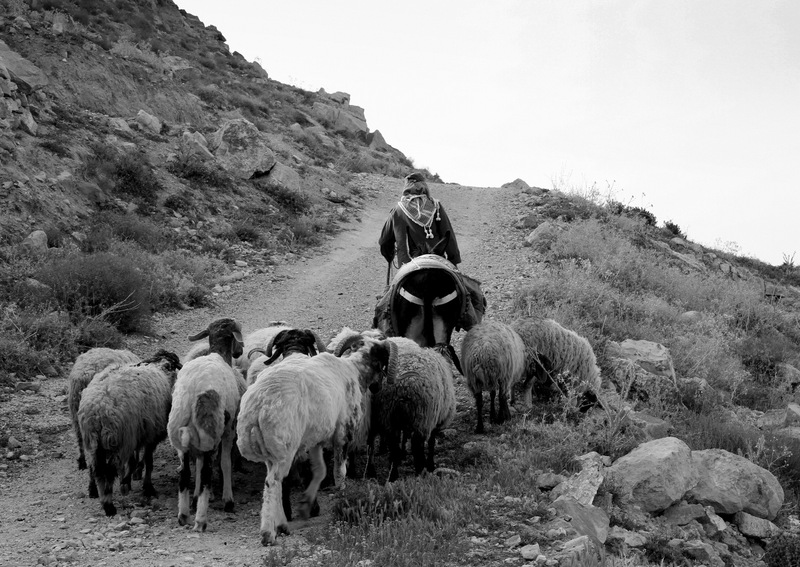 Great pictures of the shepherd and his flock. This article brought back such memories! 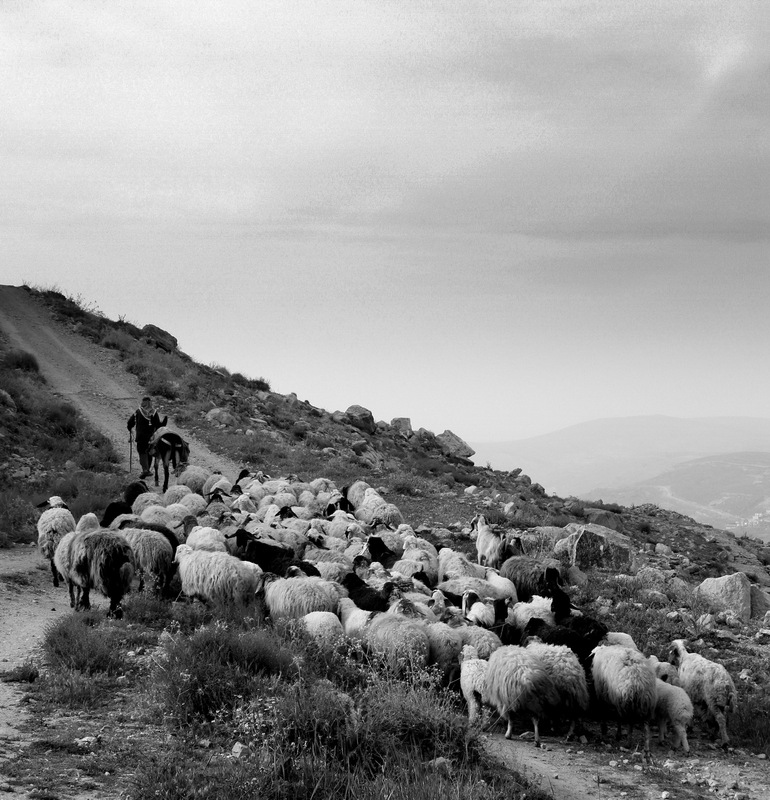 One of my earliest lessons in Jordan came from watching the shepherd with his sheep and goats in Amman, as he would head for the valley with his sheep for the evening. When they opened deep ditches to put in pipes, he had to take them across the ditch on a narrow board, one by one. The sheep listened; they knew his voice and they trusted him. It was mesmerizing, and I always came running to watch when I would hear the bells. So very peaceful and somehow reassuring.